PAEPARD: Can Public-Private Partnerships Actually Benefit the Poor? Funding from USAID/E3’s Leveraging Economic Opportunity (LEO) project. While private sector development is not new to the development community, the focus on development PPPs has important implications for development policy and practice. Little is known about the impact these partnerships have on smallholders in developing countries. Most studies on the impact of PPPs rely on information about the delivery of outputs, rather than an understanding of the industry context in which the PPPs take place. None of the available studies has systematically examined development PPPs against the interconnected context of local, regional and global industries, or market systems. The outcomes that can be achieved. While the three cases analysed are not representative of the diverse range of partnership programs, there are some lessons that may provide insight for new and ongoing partnerships. Industry gains through PPPs — be they increased exports, investment or production — do not automatically translate to smallholder, producer or household level economic benefits. If the partnership isn’t designed properly, it may end up merely reinforcing existing power dynamics in the value chain, which could result in some actors profiting more than others. Certification costs often fall to the producer, which can increase a smallholder’s production costs. Certifications are often touted as a way for smallholders to gain access to greater markets or earn premiums on their product, but in reality, their costs can outweigh potential benefits. Contextual changes characterized by the globalization of agricultural value chains not only influence patterns of production, competition, and trade; they also offer potential for public-private partnerships (PPPs) to achieve development objectives. These PPPs often result in economic growth. However, they have not always brought about significant and sustained benefits for the poor. This panel presented research findings on USAID-supported partnerships and upgrading trajectories experienced in the cocoa sector in Indonesia, the coffee sector in Rwanda, and the horticulture sector in Kenya. This research examines what historical PPPs can teach us about how to use this approach to actually benefit the poor. 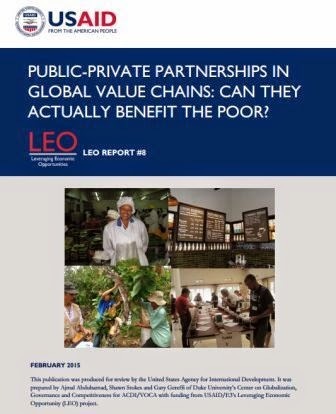 Report: Public-Private Partnerships in Global Value Chains: Can They Actually Benefit the Poor?